A few weeks ago I received a Magellan Explorist 400 GPS from Jeff Barber of Singletracks.com. 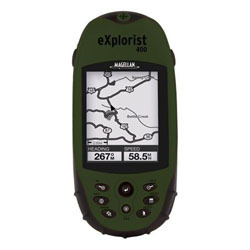 I've been the number one content contributor to Singletracks for a long time now, and I'll bet he figured that hooking me up with a free GPS (since I'm too much of a mountain bike bum to be able to afford one myself) would be a good investment in his trail maps database. 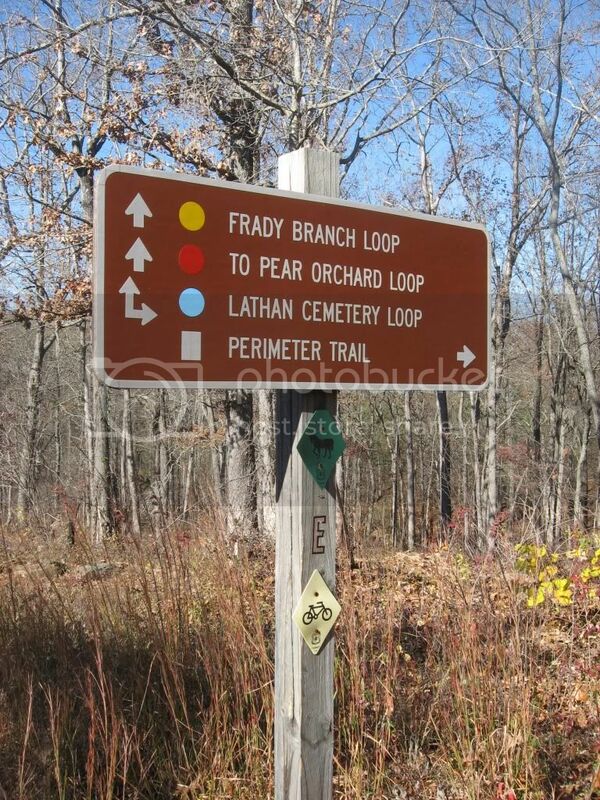 One of the first rides I mapped was the Black Branch / Vietnam / Black Branch Connector combination. The trail had not been mapped on Singletracks yet, and since it was such a good ride I knew it had to be added! 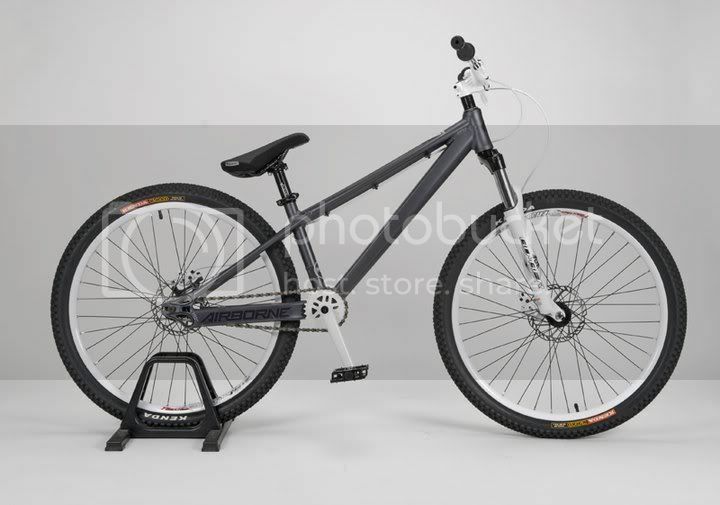 Do you ever get sick of mountain biking? Is getting out on the bike and putting in more miles sometimes the last thing you want to do, even though you know you should? That’s where I’m at right now. I know I should get out and ride because the weather is going to turn nasty tomorrow, but I just can’t seem to make myself do it. 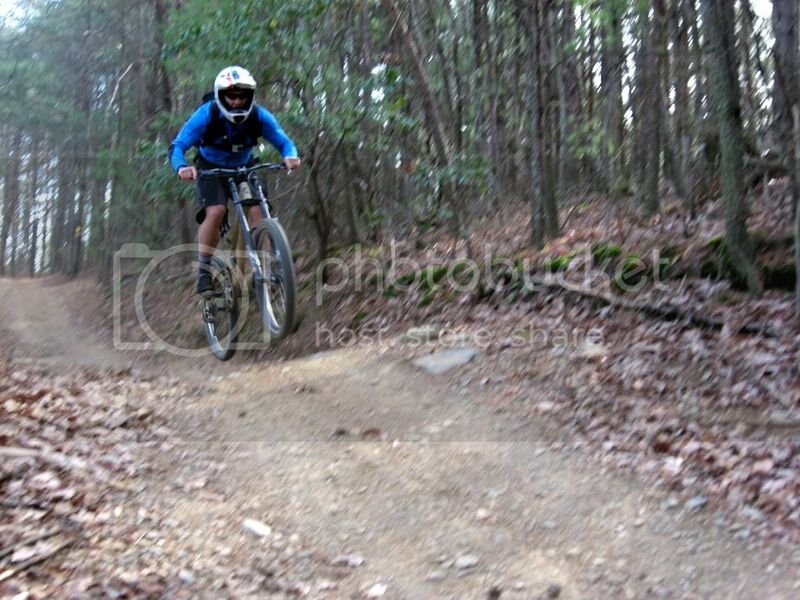 Sometimes I feel like all I do is mountain bike. Honestly, I get bored with it at times, and I want a change. The simple solution would be to focus on cross training more, but since biking is normally so much fun, I tend to get obsessive and just pedal all the time. 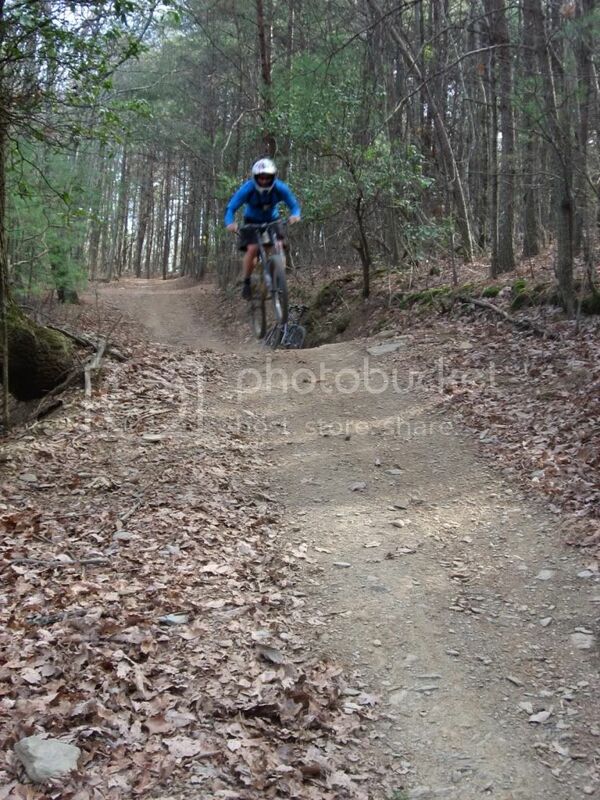 After thinking about it, I don’t think I’ve actually been on singletrack in over two weeks. Maybe that’s the issue! Maybe I’m not bored with mountain biking, I’m bored with grinding around on bland gravel roads. I am a singletrack addict first and foremost. Singletrack is challenging, entertaining, surprising--everything a forest road is not. Singletrack keeps me coming back for more. Everything is better when the trail is nice and narrow and the rocks and roots abound. Road bikers: you can keep your smooth pavement, wide lanes, and smoggy traffic! 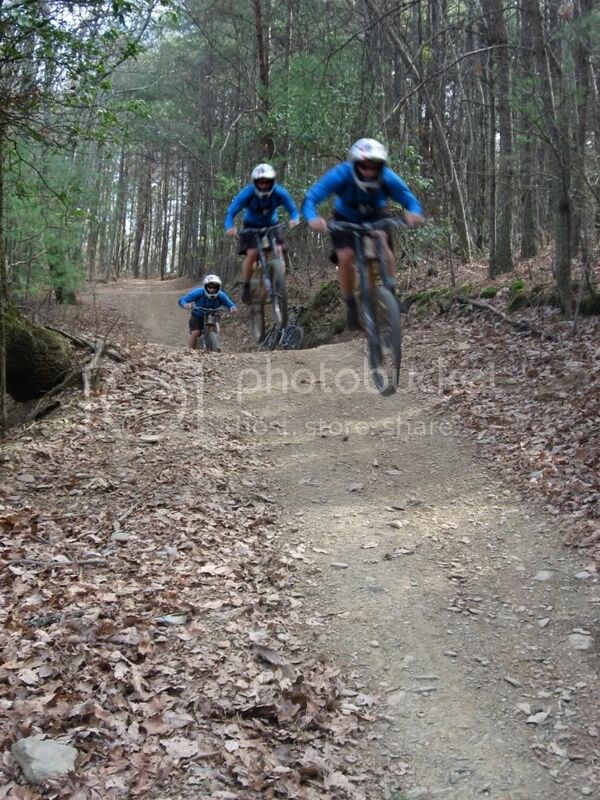 Give me singletrack any day of the week! 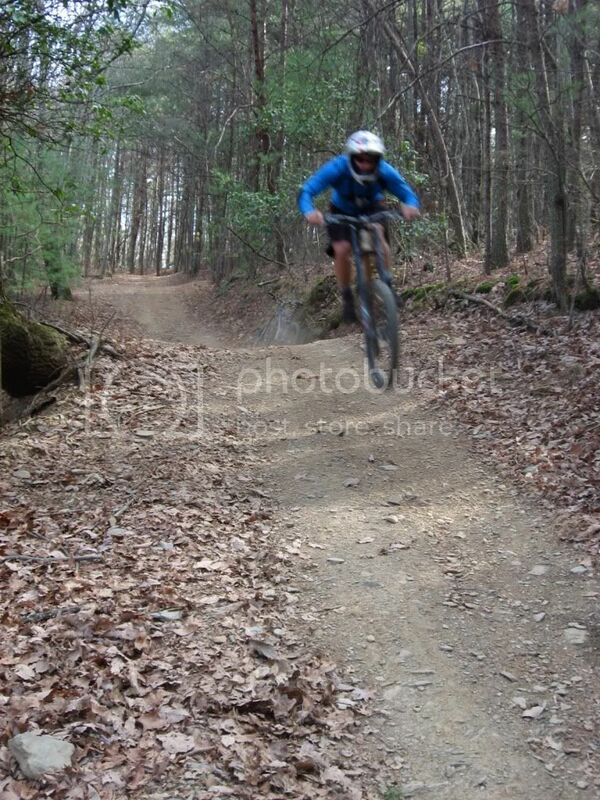 In reality, I’m probably not bored with biking in general, I’m simply singletrack deprived. Hmm… I wonder if it’s possible to get bored of singletrack too? 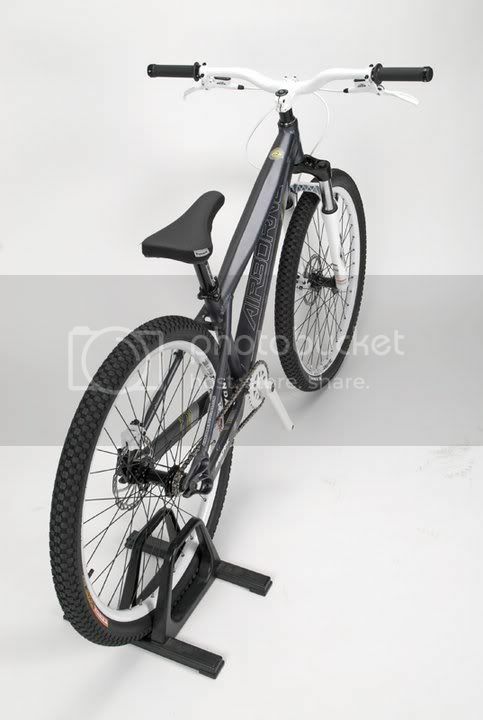 Do you ever get bored with biking? Why or why not? According to Jim Parham's guidebook, there used to be about 6-8 miles of singletrack in the Frady Branch Trail System, so I went and rode it. 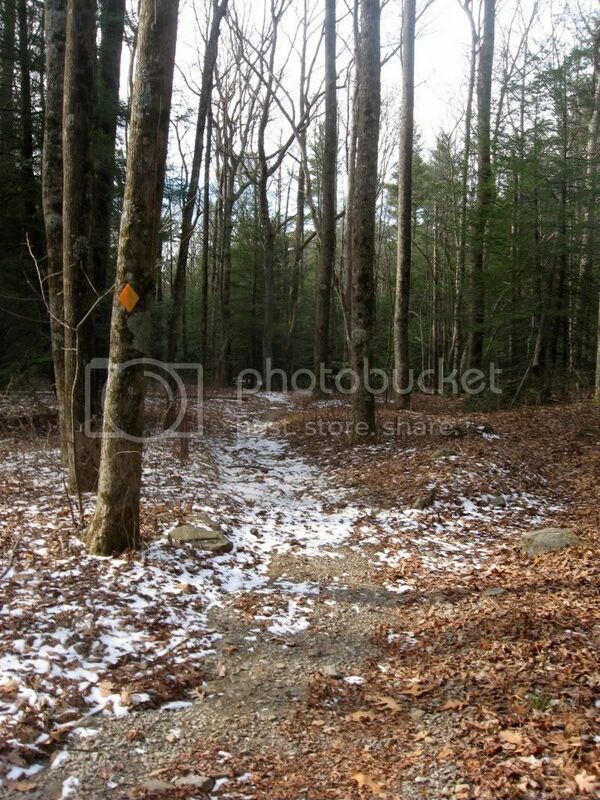 Singletrack? Not hardly! 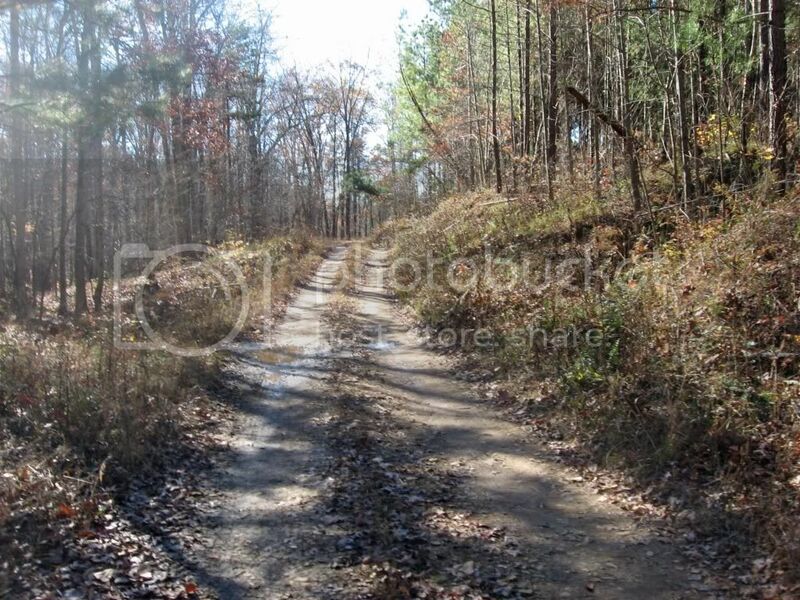 Maybe there used to be singletrack there, but as of November 26th, don't expect to find a single truly narrow trail. 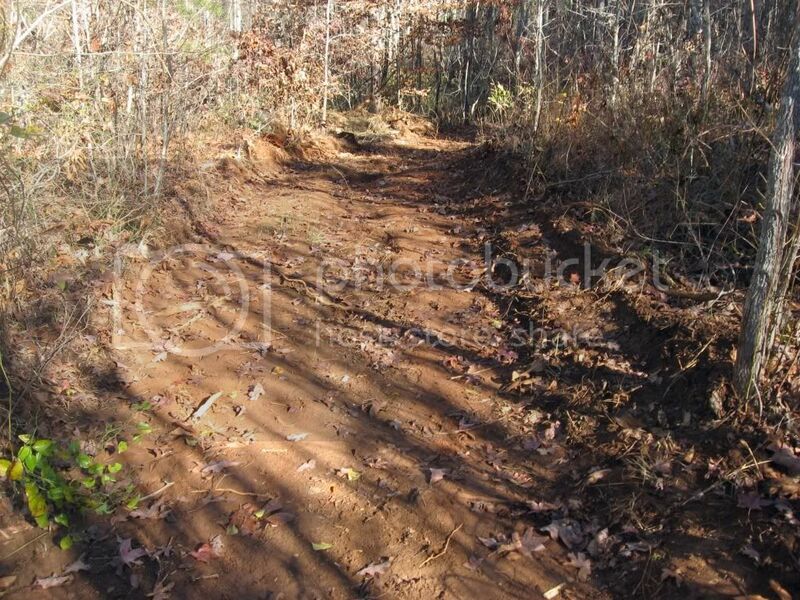 Instead of singletrack, I found trails of 4-6 feet in width that looked as if someone had taken a skidder or bulldzoer through the woods and tried to put in a freaking freeway. 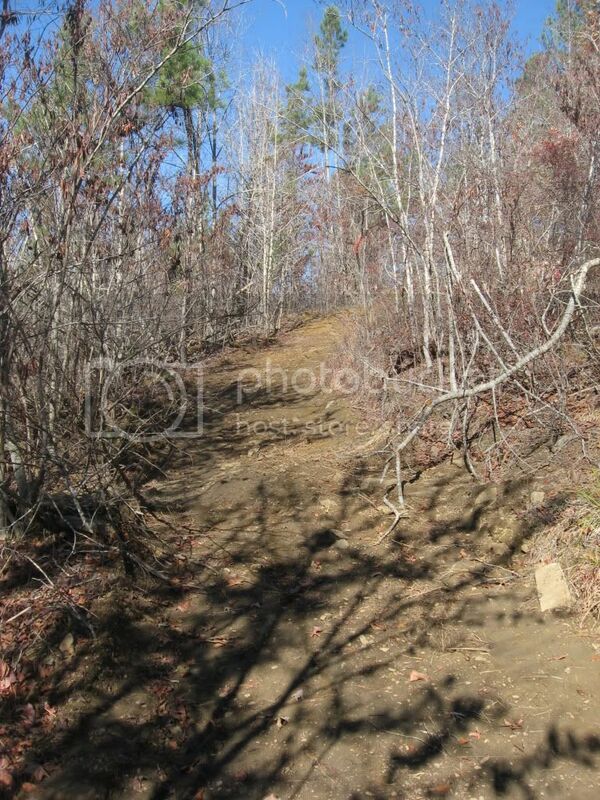 Due to the soft nature of the trail surface, the freshness of the machine tracks, and the way the blade had cut into the side of the hill and deposited dirt on the downhill side, I concluded that this machine work had happened less than a month ago on some of these trails. There is a good chance that at one time there had been quality singletrack here, and that it had recently been bull dozed over as some sort of type of "repair" to fix washed out spots. Well, I can tell you and whoever authorized these "repairs" that your "trails" are going to start washing out with the spring rains. 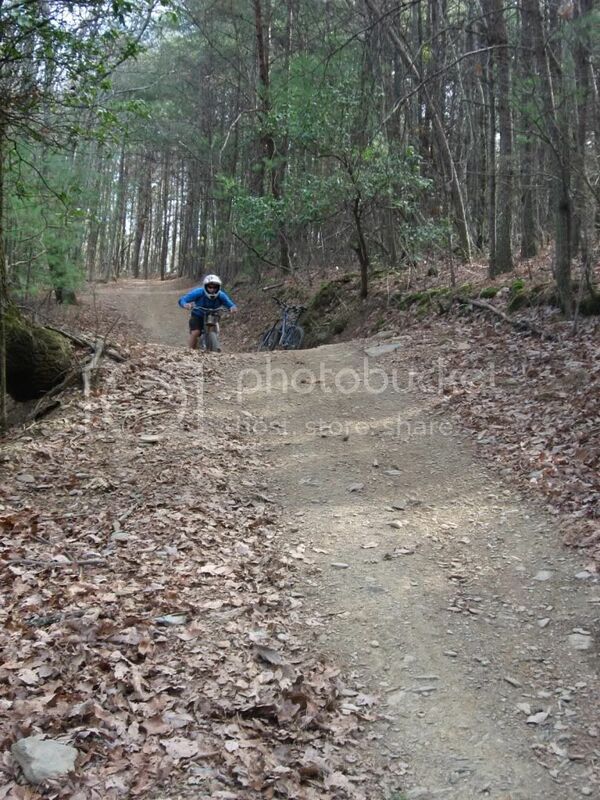 Many of the sections on the steeper hills needed to be rerouted with more bench cut trails and grade reversals. Instead, the dozers went basically straight up and down the hills at an incredibly steep angle. The only erosion control features were a couple of waterbars placed at random intervals, which I find to be a highly ineffectual way to control erosion over the long term. Mark my word, unless someone is constantly maintaining these trails, some of the hills will be washed into nasty gullies in the space of 5 or 10 years. On a more positive note, Frady Branch does have two redeeming factors. The most prominent is the abundance of historical sites that can only be accessed by bike, horse, or foot. 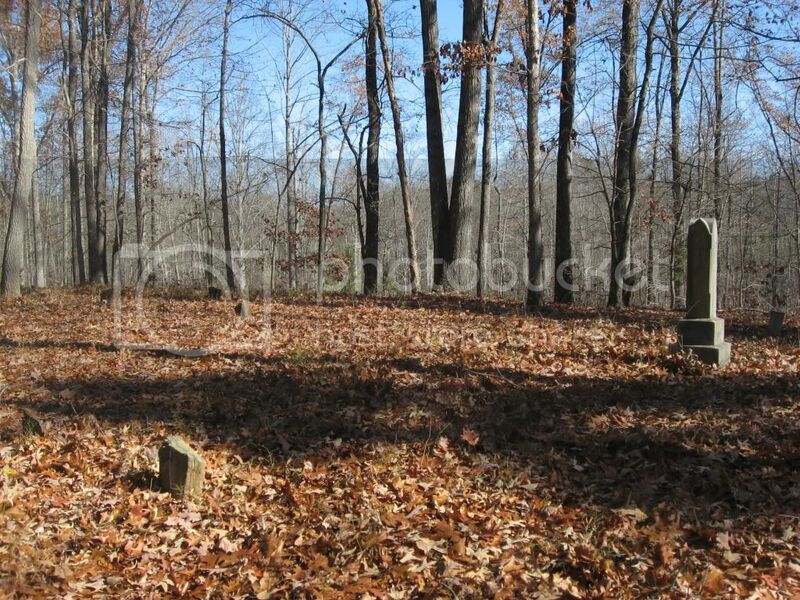 There are numerous old home sites located here in the Lake Russell WMA as well as several sizable cemeteries of over 40 graves just hidden away in the woods. 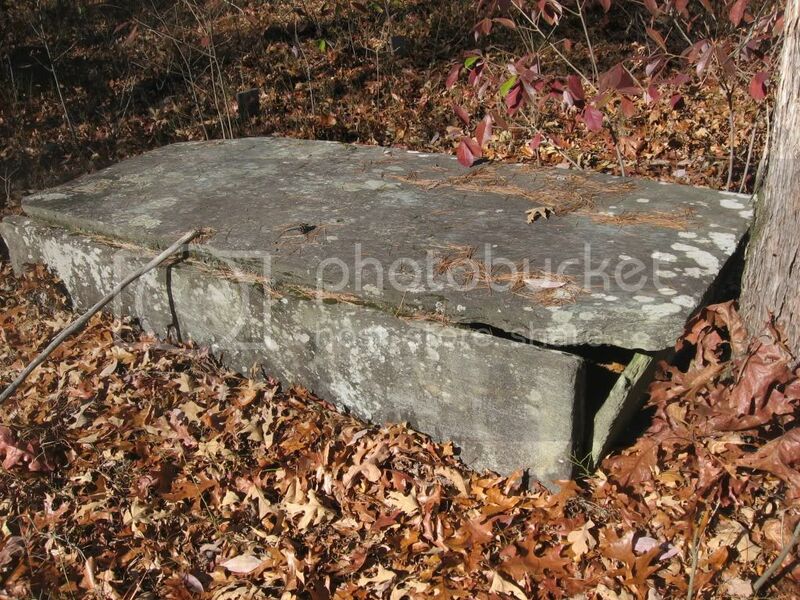 A grave of some sort in yet another cemetery. The gated forest roads are the second redeeming factor. 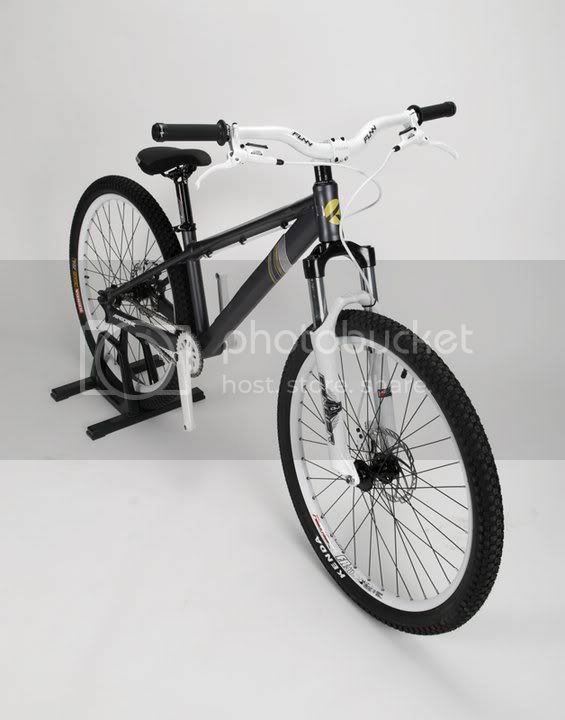 Consisting of hardpacked dirt with a few rocks, they are fast and hard with several rollers to catch some air off of. Bottom Line: I had more fun on some of the forest roads than I did on the "trails." But if you are in the mood for a ride through history, then you might find Frady Branch enjoyable. Jim Parham's Off the Beaten Track: North Georgia is a good guide to this route, and the National Geographic map #778 also includes this trail. This area is an interconnected trail system, but riding around the perimeter of the trails is a pretty good workout. While the system is well signed, I still recommend carrying the map mentioned above. 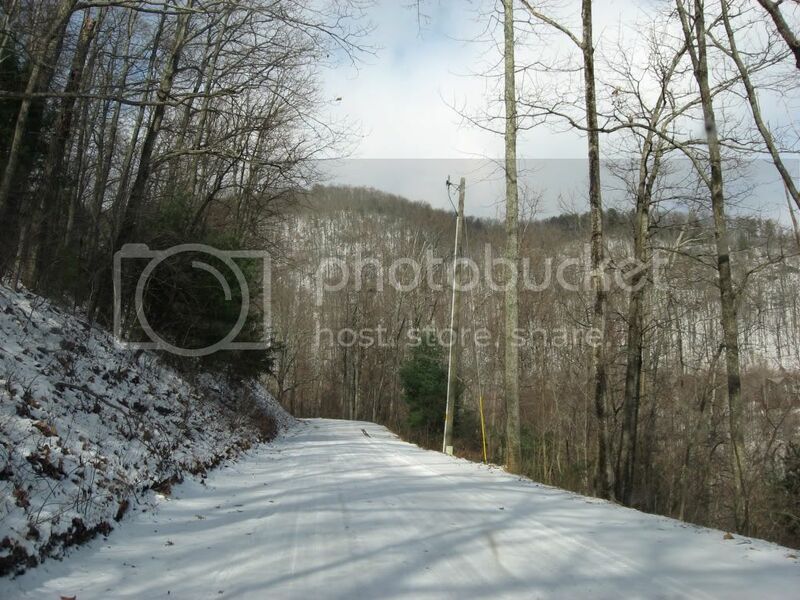 From Toccoa, head out of town on Currahee Mountain road. Cross straight over 17, and turn left on 184 after 0.5 miles. The trailhead will be on your right 2.5 miles after you make the left hand turn onto 184. Instead of turning left onto Hwy. 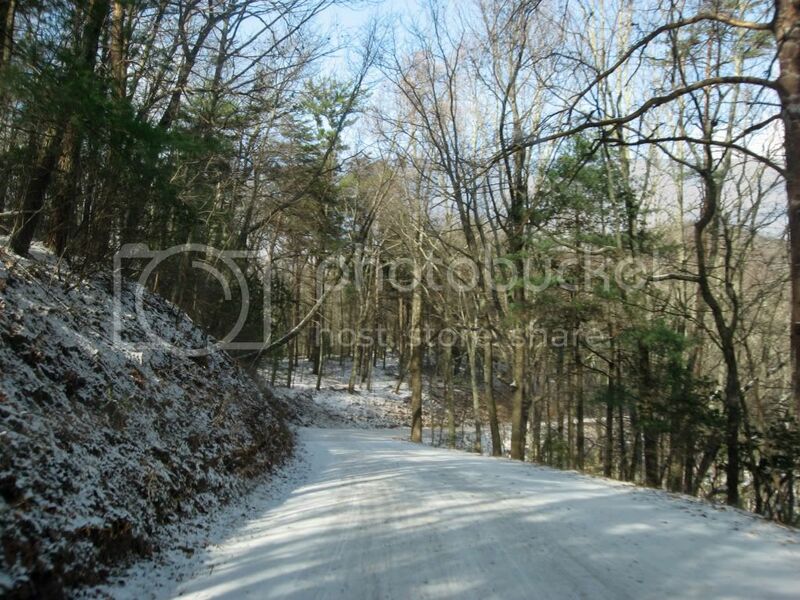 184, continue up the hill and take a left on the gravel Currahee Mountain road near the historic marker. Drive up there until you reach 62A. Park there and start riding. 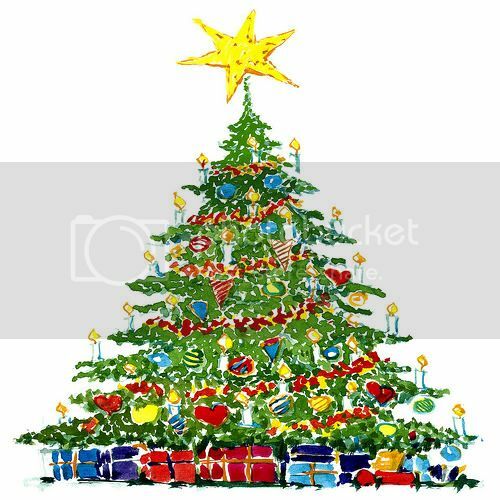 I'd just like to wish all of you awesome GRT readers a Merry Christmas! I hope your holidays are filled with fun times with family and friends, great food, and some sweet singletrack (or powder snow)! Post a comment below and let us know what your plans are for some time in the great outdoors this holiday season! 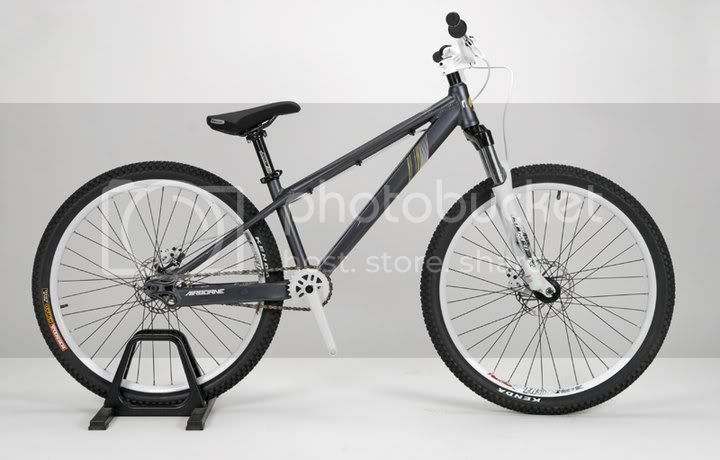 Personally, I've got to ride 65 more miles on my mountain bike if I want to hit 1,500 this year, and I am planning on doing a bunch of downhill skiing up in Wisconsin! 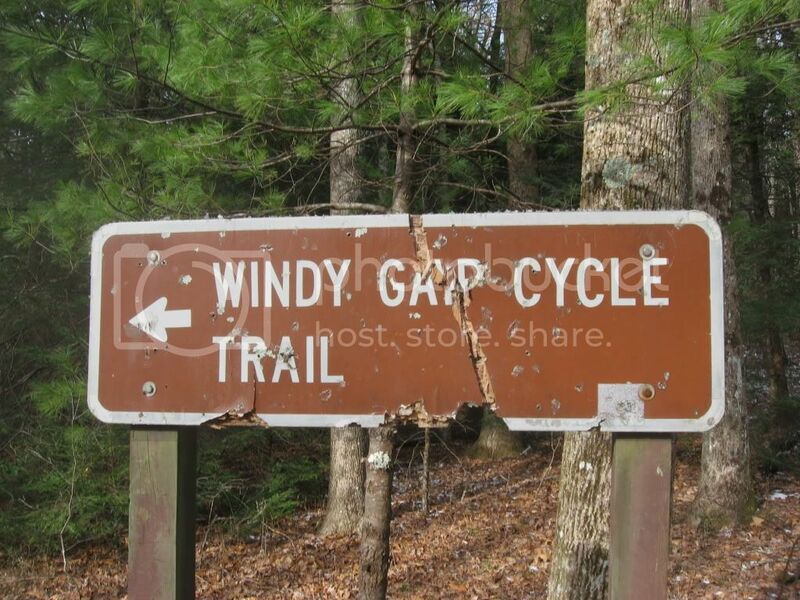 This data has already been added to the main Windy Gap trail review. 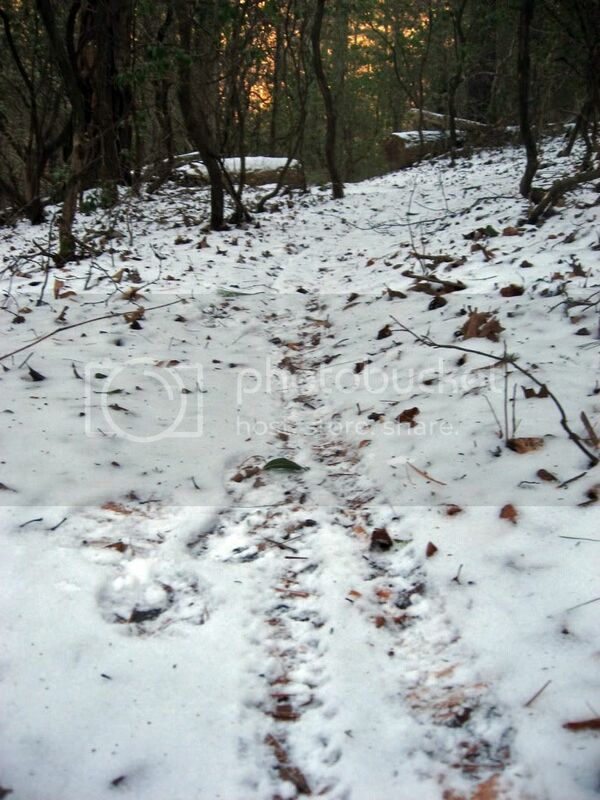 This section of trail was about as close to a groomed downhill run as a I've ever ridden! Every corner I rounded revealed jump after jump that, while they may have been designed as waterbars to control erosion, provided perfect lips and angled landings. There were even some berms nearing 8-10 feet in height! Check the video out above for the proof. Want to see Part 1: Tech? Check it out here! Want more info? The in-depth trail review is available here. We were recently having a great conversation on the GRT Facebook Page about mountain biking through the winter, so I thought a little snowy mountain bike stoke was in order! The following is a part of a series on "Everything You Ever Needed to Know about Dahlonega's Outdoor Sports." 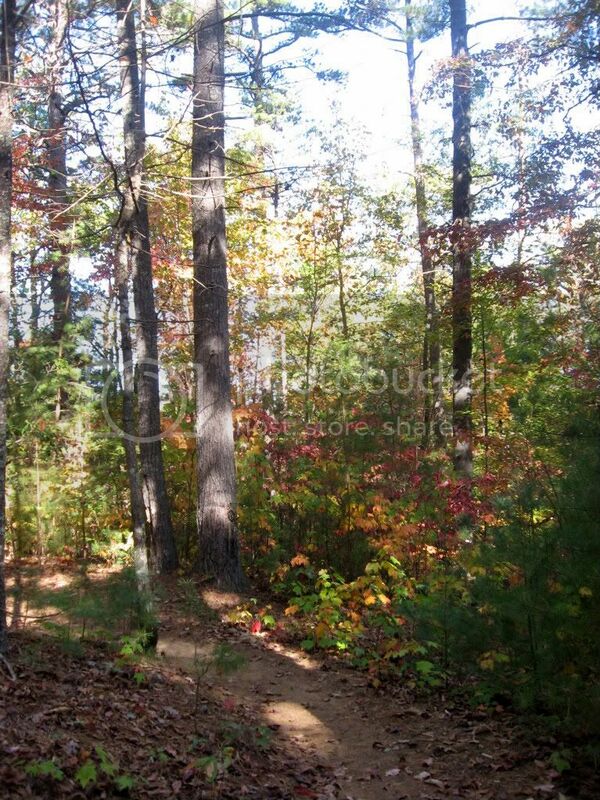 One of the cool things about living in Dahlonega is that we have access to plentiful outdoor opportunities right outside our doors, and we also are within easy driving distance of even greater natural resources. For instance, the North Carolina border is only an hour away, putting the Tsali Trail System at just about 2 1/2 hours away. Pisgah National Forest is roughly 3 1/2 hours from here, and the Chattanooga, Tennessee area is about 3 to 3 1/2 the other way. All of those locations hold classic mountain biking! In addition, the Chattanooga area has a heavy saturation of rock climbing opportunities, and Pisgah also contains some great rock to climb. 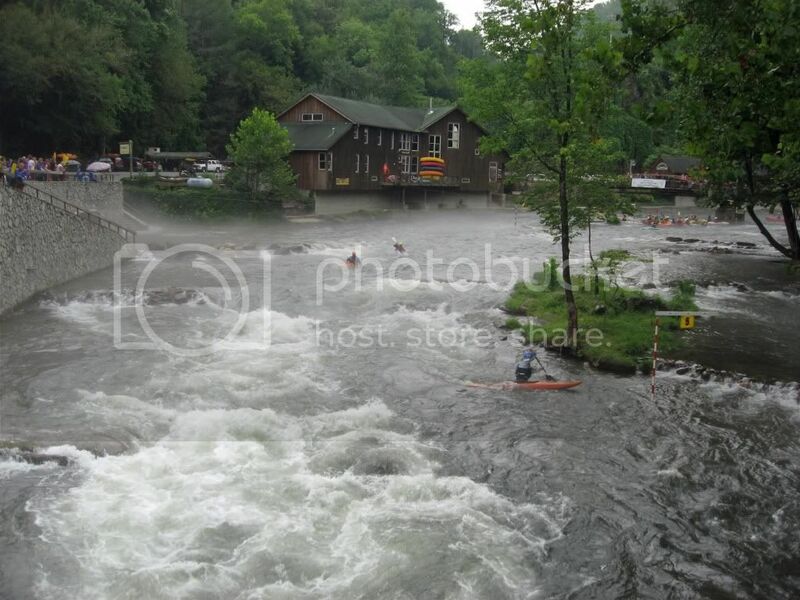 The Nantahala Outdoor Center located between Dahlonega and Tsali is the place to be for everything whitewater... and it has a nice mountain bike trail, too. As far as hiking and trail running is concerned, anywhere near the Appalachian trail is going to have an abundance of foot-travel-only trails, and since the A.T. winds all across Georgia and North Carolina, you can be sure this entire region qualifies! Outdoors sports abound here in North Georgia: mountain biking, road biking, day hiking, backpacking, trail running, canoeing, slow water kayaking, whitewater kayaking, rock climbing, bouldering, and probably more! The one thing we don't really have access to is a reliable winter season, which I find exceedingly frustrating due to my long-time addiction to powder skiing. 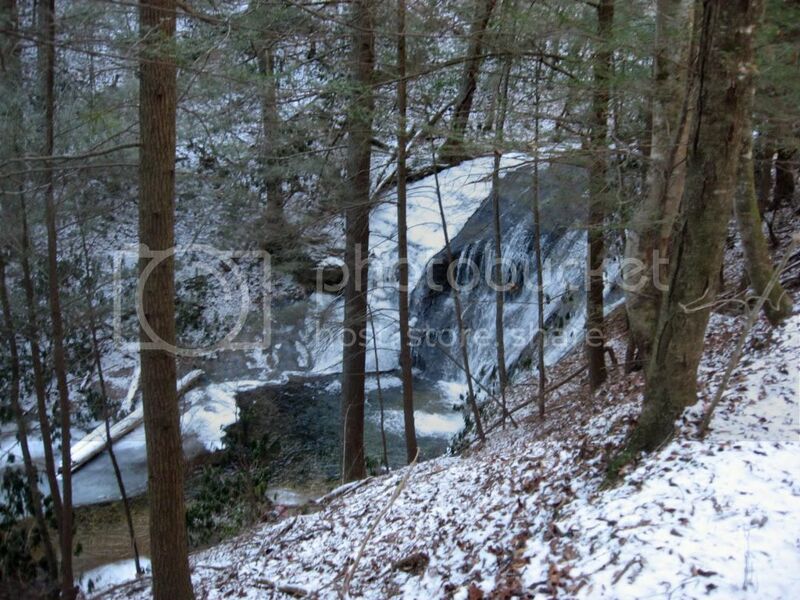 So beyond the lack of downhill skiing, cross country skiing, and snowboarding, Dahlonega and the greater North Georgia Neighborhood have got you covered! The town of Dahlonega is surrounded by several rivers and sizable streams: the Chestatee River, the Etowah River, Yahoola Creek, Cooper Creek, the Toccoa River, and more. It seems like everywhere you turn you're driving across a bridge or overlooking a river! Since I am not a regular paddler myself, this look at the river culture of Dahlonega is based off of what limited observations I have been able to make, people I have talked to, and the research I have been able to do on the internet. Down on the Chestatee there are a couple of touristy outfits renting out inflatable tubes to tourists, but thankfully they aren't as plentiful as the tourist outfits over in Helen are. The Chestatee is wide and slow, making it ideal for those tubing businesses as well as canoeing. In fact, one of the rental places, Appalachian Outfitters, rents canoes and kayaks as well as tubes, making it a much more legitimate establishment. One of the parking lots near that business is designated as a public put-in/take-out spot, and I have noticed several other unofficial landing spots along other parts of the river. 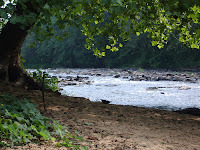 The Toccoa River located north of Dahlonega near Blue Ridge is another popular river for canoeing. There are several canoe launches along it, complete with National Forest campsites and bathrooms. Near the Aska area there are several outfitters that also rent canoes if you are looking to try this sport out for the first time or don't want to haul your canoe with you on vacation. 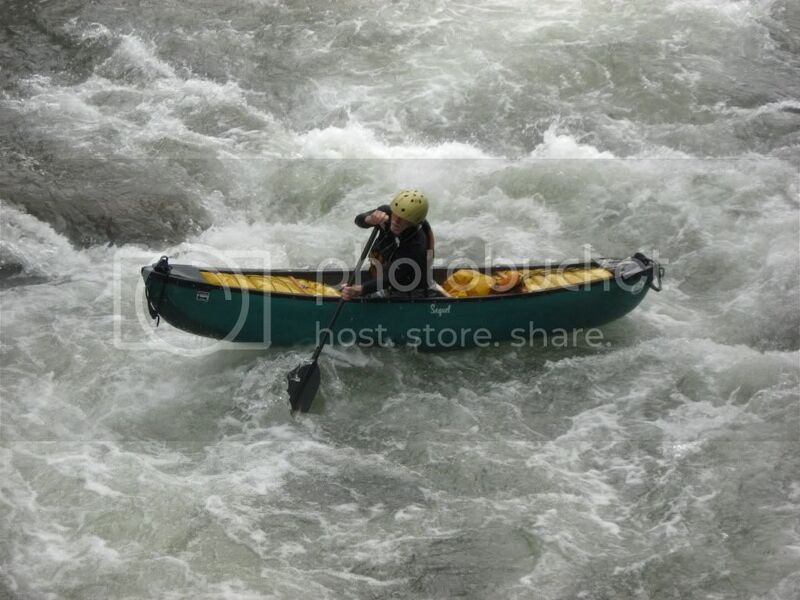 More information on canoeing the Toccoa River is available here. More aggressive whitewater can be found on Yahoola Creek and the Etowah River. The guys that live in the apartment next door to me are totally stoked on whitewater kayaking. During the summertime it seems like their kayaks never leave the backs of their vehicles as they are always out on the water. Based on the short conversations I've had with them about it, Yahoola Creek is one of their favorites. Here's a quick run down on some of the more frequent runs. You can check them out on the American Whitewater Website. There are local canoeing and kayaking opportunities aplenty, and hopefully the information here will help you find some great spots to paddle! Your Turn: Are you a paddler with more detailed first-hand information about the rivers and streams in the area? Please drop a comment below and give us the low-down! 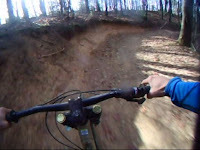 I rode one of the funnest downhills of my life yesterday... and it was here in North Georgia! And yes, I am a lot higher in the air than I look! A big thanks goes out to Jeremy for the photos! 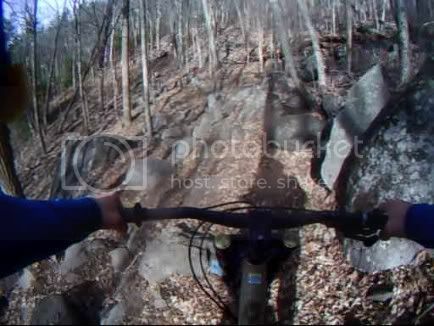 Windy Gap DH Part 1: Tech video is now live! 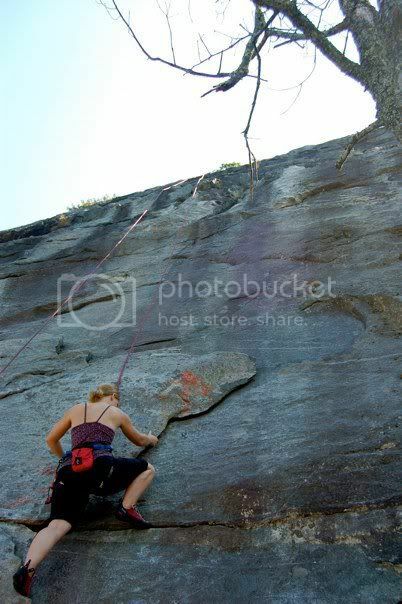 Rock Climbing at Mount Yonah. Climber: Summer. Photo: Syndah Swails. The closest real rock climbing to Dahlonega is about 45 minutes away at Mount Yonah in Cleveland. My wife and I have been there numerous times and have gotten to know the those slabby granite cliffs very well! Many of the bolted sport routes are very easy and beginner friendly, which is good if you're a beginner, but not so good if you are looking to advance your skills. In addition to the sport routes, there are a number of multi pitch trad routes, as well as a couple of short 5.12s. As a result, Yonah tends to attract a diverse mix of climbers ranging from the very green to the seasoned trad climbers just looking for some slab climbing. About an hour and a half from Dahlonega is Currahee Mountain in Toccoa, which offers even more granite slab climbing. There are actually one or two walls with some near-vertical sport routes, but on the whole Currahee is slab. Almost all of the routes are bolted, and there are many more routes with medium-high difficulty ratings as compared to Yonah. As a climber, I've naturally done some bouldering and know how to boulder. Still, I wouldn't consider myself a "boulderer" as I would much rather be ascending a massive cliff than trying to nail a hard problem again and again only 3 feet off the ground. But from what I have heard, the bouldering opportunities are far more plentiful in the Dahlonega and greater North Georgia area than are the opportunities for true rock climbing. Based on what I have heard and read on the internet as well as the chalk I've seen on some of the rocks, the area around the top of Blood Mountain (north of Dahlonega just a few miles) has a large boulder field with problems to be worked. The access hike to those boulders is several miles long, so a much more popular destination is Rocktown, about 2 hours to the west of Dahlonega. Dahlonega definitely doesn't have a strong climbing community, but if you are into rock climbing and are planning to move to Dahlonega, rest assured that there are a few opportunities to get your hands full of chalk! 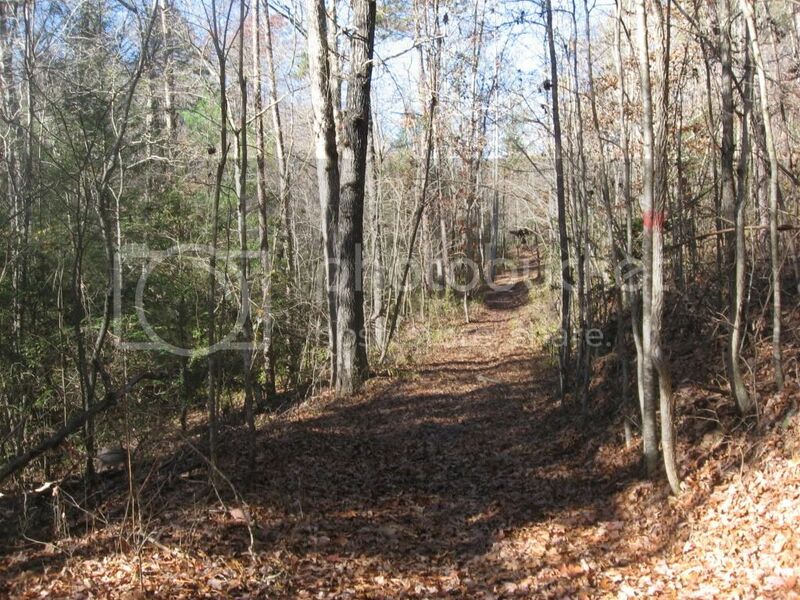 The following is an update which I have added to the Montgomery Creek Loop trail review. While not nearly the most interesting or challenging trail in the Bull/Jake Mountain Trail System, Montgomery Creek has certainly been the most dynamic lately. 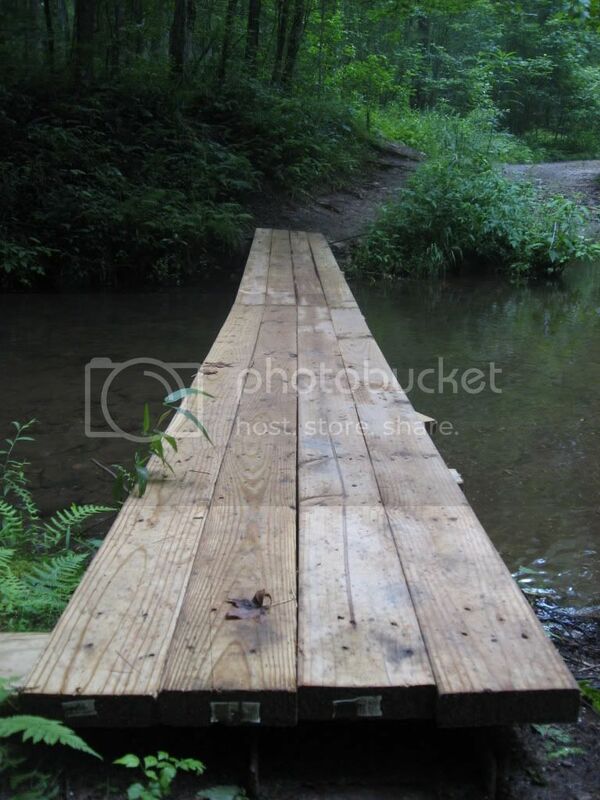 This past spring some benevolent figure who currently remains a mystery built an excellent wooden bridge across the old metal I-beam to make this stream crossing much more rideable. While the old I-beam was a nice challenge, I definitely didn't feel comfortable risking a cold swim every time I rode this loop. 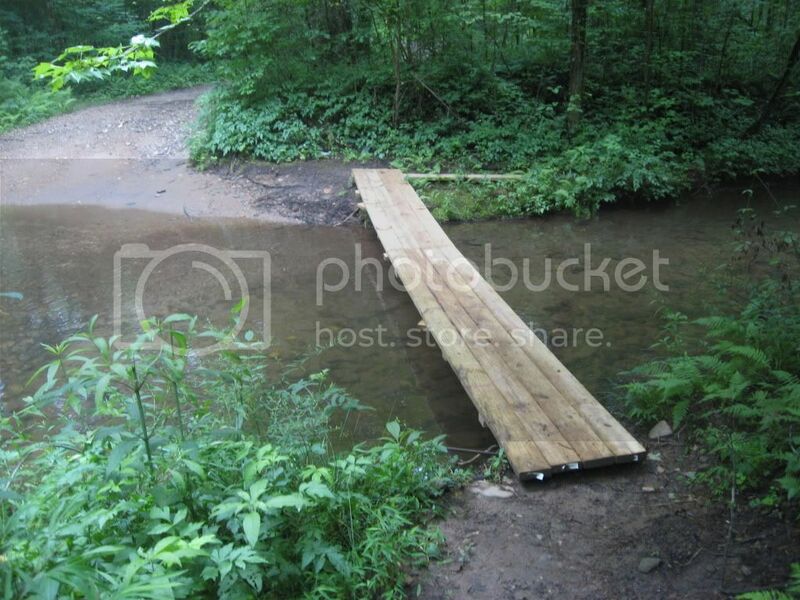 When ridden in the counter-clockwise direction, this bridge works easily into the flow of the trail. When you approach it going clockwise however, the turn onto the bridge is very sharp. I think that it will be doable with some practice, but I ride this loop counterclockwise about 90% of the time, so it usually flows easily for me. In my opinion, the new bridge is a welcome addition to this ride! 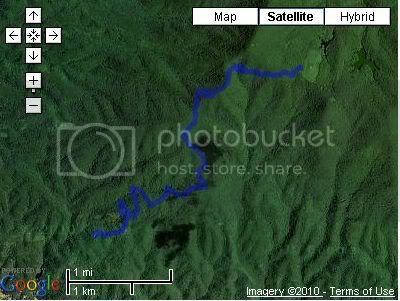 At the time of this update, there is a serious logging operation in progress on the lower end of the loop. The skidders and logging trucks are utilizing the same doubletrack that this ride runs along for their skidders and log trucks. In fact, they have a big crane set up directly above the gated road for loading trucks with logs. When I rode through last I was fortunate enough to have the place all to myself, but I have ridden through the vicinity within the past week while on the No Tell trail and could hear them loggers hard at work right next door on Montgomery Creek. At this time, I'd advise you to avoid Montgomery Creek unless you know that they aren't logging on it at the moment, or unless it's the weekend. It's a shame really, because this time of year when the rain starts picking up and the singletrack remains wet for longer is when we really start frequenting the various forest road rides such as Montgomery Creek. Hopefully the logging will be done sooner rather than later, and we can get back to pedaling through the forest in peace! The series "Everything You Ever Needed to Know About Dahlonega's Outdoor Sports" will return on Friday. 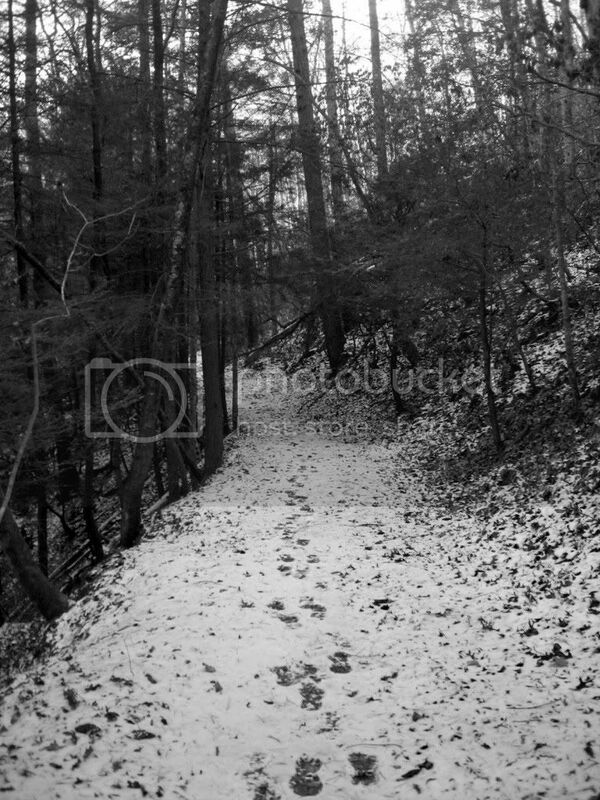 The North Georgia Mountains surrounding Dahlonega are world famous for their beauty and difficulty. 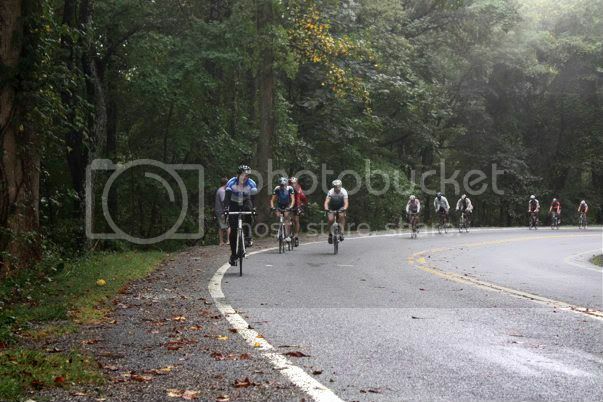 The epic climbs up Brasstown Bald, Hogpen Gap, Wolfpen Gap, and Woody's Gap have all been made famous by the Tour de Georgia, as well being the routes for the City of Dahlonega's famous Six Gap Century. Bike riding in Lumpkin County allows you to experience the roads, climbs, and conditions that face UCI Pro Tour riders all within riding distance of Dahlonega Wheelworks' front door. The Six Gap Century’s ultra challenging route takes you up and down six of the steepest climbs in the North Georgia Mountains. Test your stamina with more than 11,200 feet of vertical climbing over the 100 mile course. 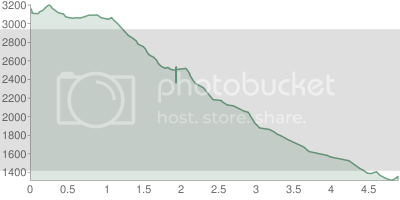 Elevations for the six gaps in this ride range from 2,949 feet to 3,490 feet. The toughest climb, Hogpen Gap, will test even the strongest riders, averaging a 7% grade for seven miles, with sections as steep as 15%. The Three Gap Fifty’s alternative route offers half the gaps and half the distance, but is nevertheless a demanding and challenging course. Elevations range from 3,109 feet to 3,280 feet. 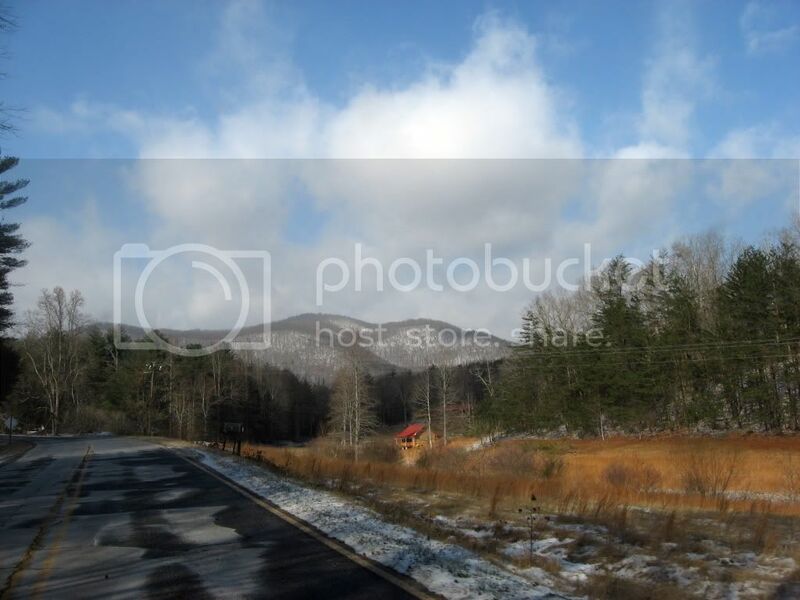 In addition to all the statistics mentioned above, the Brasstown Bald road is located an hour or so away by car and climbs steeply up to the highest point in Georgia, topping out at 4,784 feet. 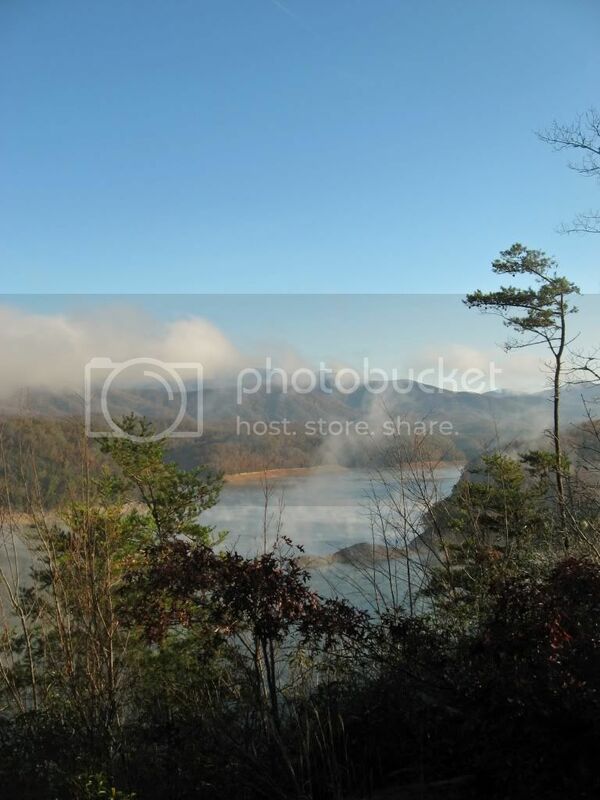 Along with the nationally-renowned routes in the area, there is an untold number of unsung highways and paved back roads spidering across the Lumpkin County countryside. People travel to Dahlonega from all over the country to ride road bikes, and as you can see from the testimonials and statistics above, the cycling here is really something else! 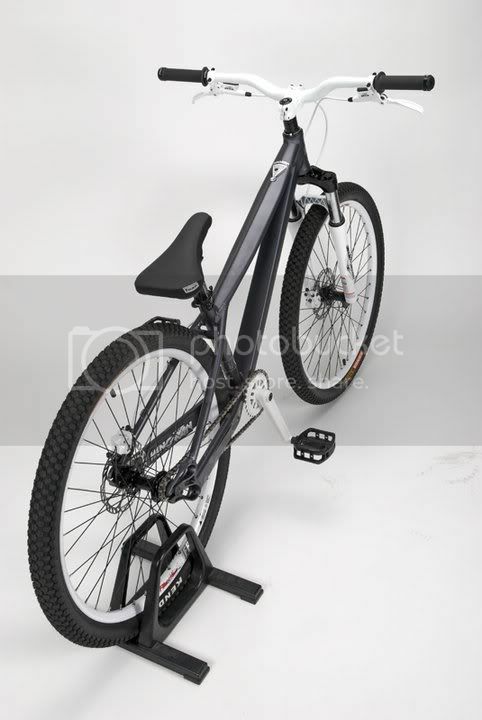 Airborne has just posted some sneak-peak photos of the graphics on the new jump bike. This singlespeed airborne demon has been dubbed "The Wingman." Several of the Flight Crew have already been testing prototype models of this rig, and they all love it! Word on the street is that it will retail for about $749.99. What do you think the best graphics combination is? 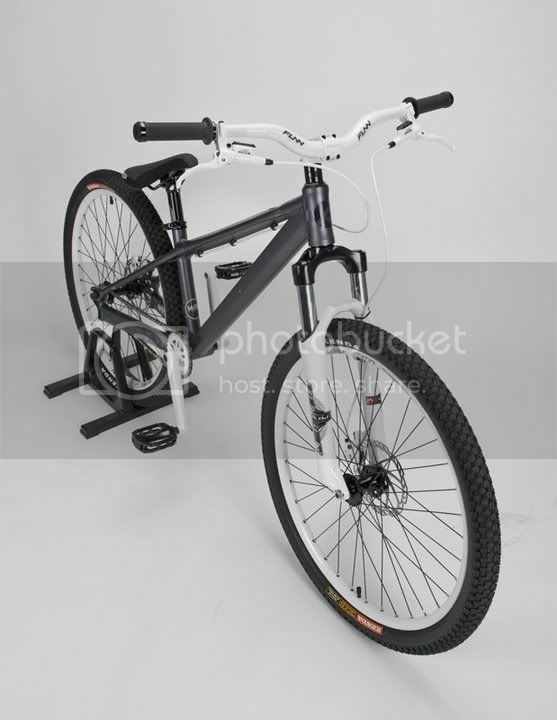 You can have your say by going over to the Airborne Bicycles Facebook Page and dropping a comment with your opinion.